Several varieties of hydras exist, winged dragon types, slow moving swamp types. Serpent types and even types that walk like a man. Hydra are docile herd animals, raised for food. They have multiple heads due to breeding practices to increase the yield of the head which is used to make delicious soups and jellies. The above is a lie, because as magical beasts, the hydra has nothing so prosaic as blood. The growth is caused by the salty tears of innocent slaughtered animals, slain without propitiating the spirits of the forest. Historiae Animalium , illus. unknown (1551). 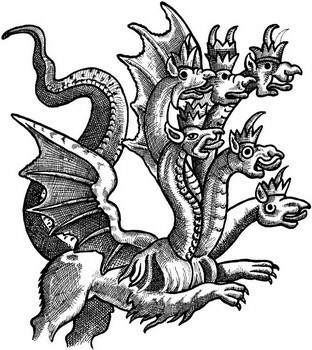 A multi-headed hydra only has one head, inside the mouth of which is another head, like a russian stacked doll. It's heads all the way down. The hydra has a regenerative organ deep within its body. It is coconut-sized and gristly and is called a terratocopia, shaped like strange, juicy sea-shell. 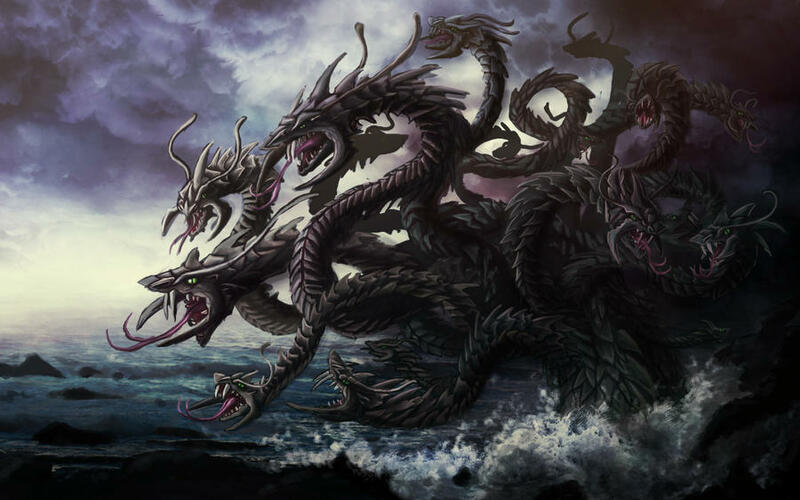 Each hydra is not a separate beast, but an individual sensory organ of a much larger creature. They are extensions into this dimensional realm and learn about it much like babies, by taking the things within it and consuming it. Hydras are an endangered species. This is purely coincidental and has nothing to do with the terratocopia or any cultures specific believes about the said organ. A maiden per head surrounding the hydra works as an effective method of neutralizing the beast. Spread in a circle equidistant from the hydra results in confusion. Hydras gain immunity to an attack that removes a head, making the single or double-headed hydras the most dangerous. Each head believes itself to be the main head and is conflicted between protecting the body and eliminating its competition. Hydras are magic creatures that require no food. They kill out of inborn aggression and pleasure. Soon even this grows dim and they become insanely aggressive.